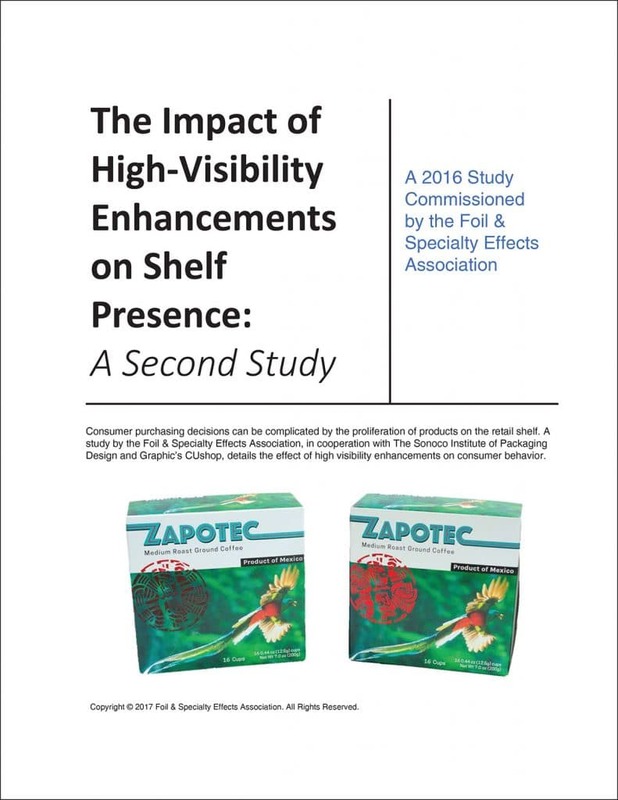 Topeka, Kansas – The Foil & Specialty Effects Association (FSEA) has officially released its second white paper on “The Impact of High-Visibility Enhancements on Shelf Presence.” This second white paper, based on a study conducted by the Sonoco Institute of Packaging Design and Graphics at Clemson University, examines an unknown brand of disposable single-serve coffee packaging that was created specifically for the study – Zapotec – and compares it to name brand packaging on a retail shelf. The Zapotec packaging was studied in three iterations, with both a control and an enhanced package: a printed Zapotec package with a printed red emblem; a printed package with a red foil stamped metallic emblem; and the same printed package with a gold foil stamped metallic emblem. The Foil & Specialty Effects Association (FSEA) provides a wide range of resources to help companies remain profitable today and into the future. From cost-saving programs and educational opportunities to green initiatives proving the sustainability of foil decorated paper/board, the FSEA strives to provide its members with ideas, resources and solutions to grow in today’s marketplace.